My mother lived with her family at 212 Clinton Street, in Brooklyn. I’ve looked up the Enumeration District and it looks like it is 24-69. I’ll have to wait until Monday to know for sure. The place to check is NARA 1940 Census. Other sites like Ancestry and Family Search won’t have it on the first day. In 1940 my mother worked for Dr. Bonsole in Manhattan. What was her title? I hope to find out on Monday. Babsie knew a trick for pulling baby teeth that she learned back in 1940. 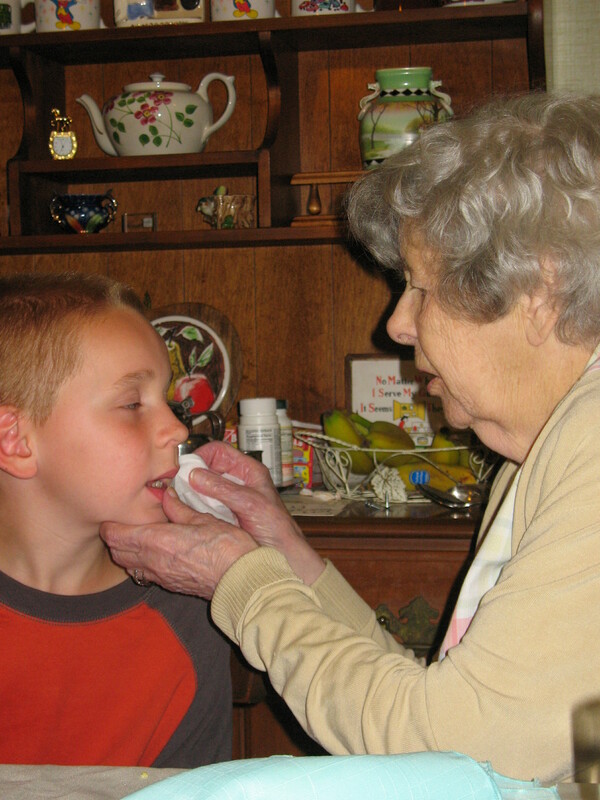 In 2008 her great grandson asks for help - but his tooth was not loose enough. Will the computers crash? The experts say no – there are several sites that will have the 1940 Census and they are prepared to handle the crowd. We’ll find out. I have a list of family members, but I still need to check addresses and enumeration districts – what am I waiting for? I guess I thought April 2nd was still weeks off. My to do list this week is to be ready on April 2nd. The New York Public Library is planning to put the 1940 New York City Telephone Directory on line and link it to maps and the Steve Morse One Step site. This site makes it easy to find the enumeration districts throughout the U.S. by taking the Tutorial Quiz. Of course, I really want to see the 1940 census indexed and that’s going to require a lot of volunteers. I’ve signed up, I just have to wait until the census is released before I can start indexing. If you are interested in volunteering to index go to “The 1940 Census” site and sign up. There are more than 132,000,000 names – that’s a lot of names to search through. It will take 6 months or more to complete the indexing project. The more people who volunteer, the faster the 1940 Census will be indexed. 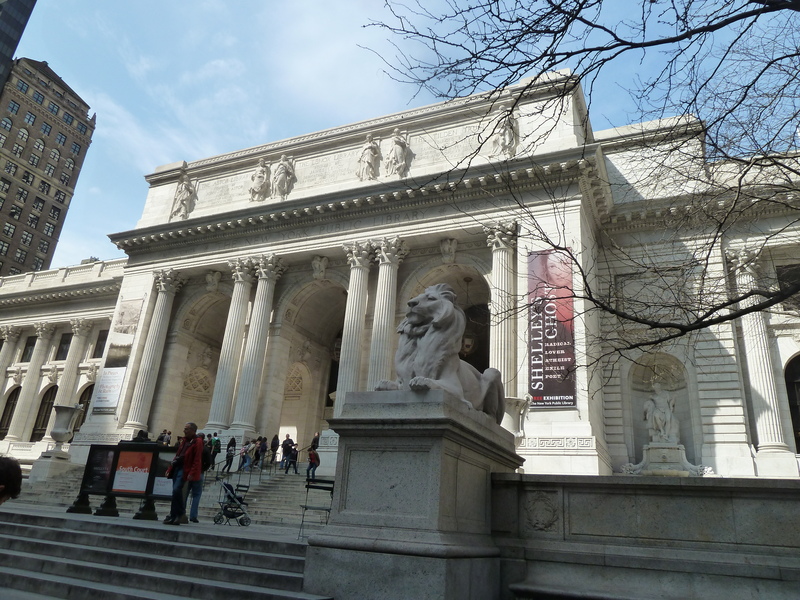 Yesterday I was at the New York Public Library for “The Road to the 1940 Census”. It was a great progam and I learned a lot, not just about the 1940 census but about finding information in older censuses as well. While I was at the libary I took a few pictures. On April 2, 2012, we will be able to see the 1940 U. S. Census. My grandparents and my parents and the whole Colbert and Whelan gang should be there. My parents weren’t married yet, but they were dating – they met in 1939. What did they say they did for a living? how much did they make in 1939? What was their education? 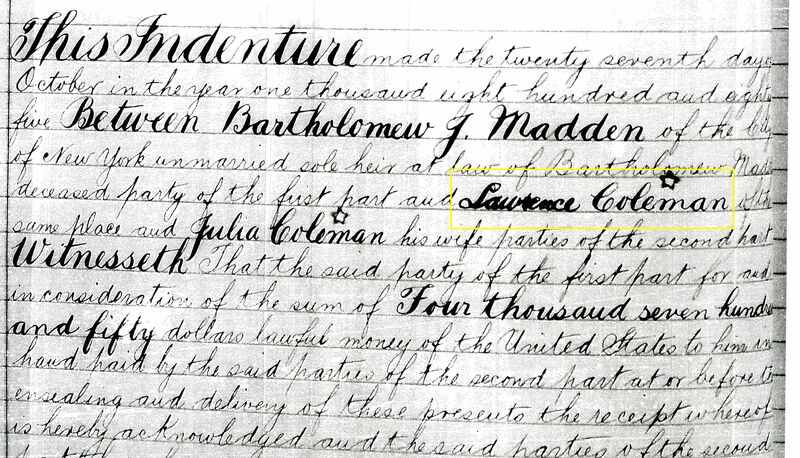 Who provided the information to the census taker? Grandma Whelan for the Whelan gang, I’ll bet. But who was home when the census taker came to the Colberts? Was Aunt Frances still in school or had she started working? What about Uncle Mike? Uncle Jackie and Aunt Joan were in school, I’m sure. Was my father already in Baltimore? 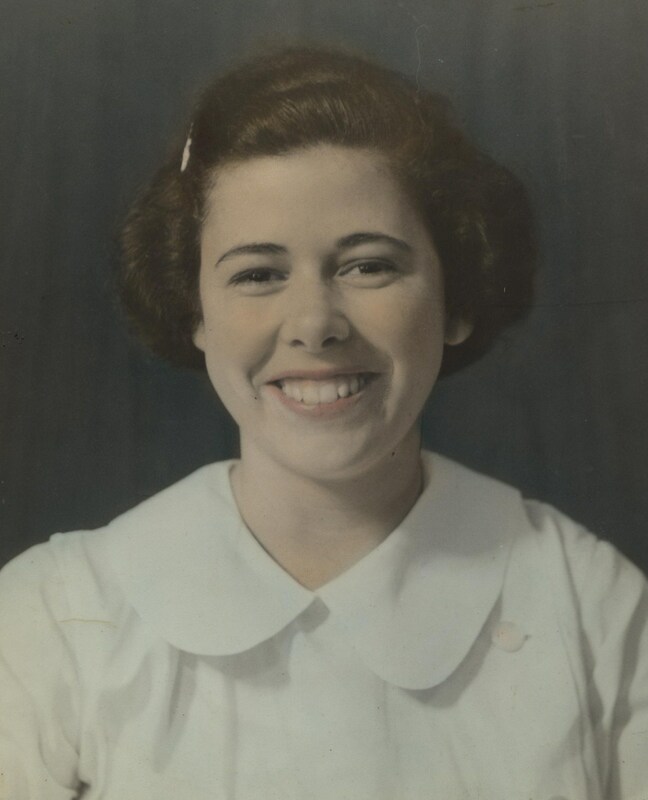 Was Mom working as a dental hygienist? Will there be any surprises? 20 days to find out!! 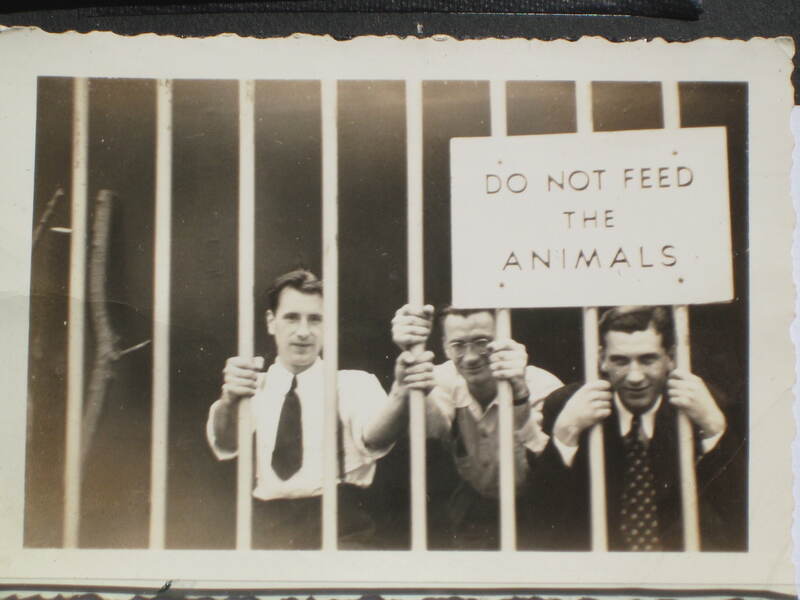 June 1940 - That's my father and his cousins Bill and Jimmy Rogers - hope they filled out their census forms before they went to jail (at the New York World's Fair) - picture taken by Uncle Joe. I recently searched land records in not one, but two counties: New York and Dutchess. I went back to 66 John Street to get more information about the lot that Mary Coleman Colbert leased. She was quite the fighter. 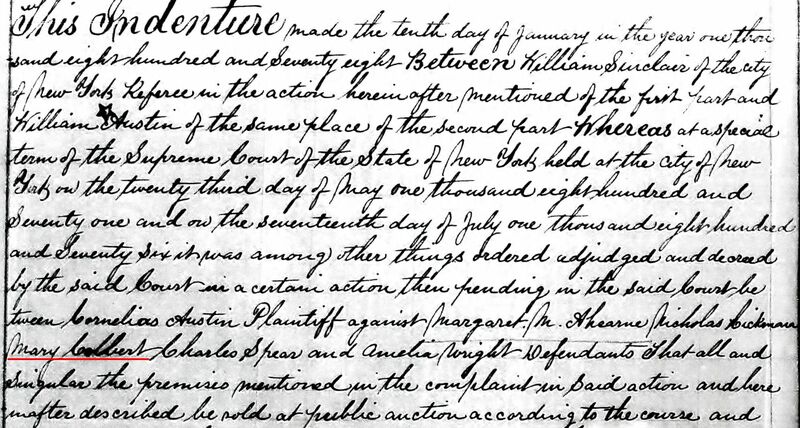 She did not give up on her right to the 15 year lease she had obtained in 1865. The plaintiff, Cornelia Austin, did not give up either and kept appealing decisions that did not go her way. The property was finally sold at auction in late 1877, with Mary’s case still open. The other tenants were apparently paid costs out of the sale. I don’t know what happened with Mary’s costs, but she seems to have been able to stay until the end. The property where Mary Colbert lived was sold at auction in late 1877. Her grandson, John Grossman, first child of Mary Colbert and George Grossman, was born in his Grandmother’s house in September 1879. Mary’s lease ended on April 1, 1880. A few months later, in June 1880, the family is living in Bronxville, Westchester County. When they returned to the city they lived at 421 East 12oth Street. Not only was this right in back of their old place, it was the lot that had been leased by Charles Spear, one of the other tenants named in the lawsuit! Curious. Spear gave a description of his house in his testimony, so I’m going back to the Old Records Room to check it out. I was also able to find that Mary Coleman Colbert’s brother owned a house in Manhattan, also on East 121st Street, but several blocks west. He bought it in 1885, but didn’t move there until 1900. Maybe he rented it out? Lawrene Coleman and his wife Julia bought this house in 1885. In New York you usually look up the block and lot number – after all, New York is divided into a grid. In the Dutchess County Clerk Records Room you search using the grantor/grantee books and look for the name. I found what I was looking for quickly and then went straight to the liber to see the deeds. These libers are heavy, and I believe the ones on the bottom row are heavier! I looked at another deed (typed). This one was from 1926 for property in the City of Beacon and had an interesting clause. I think it may have been carried over from a previous deed. What do you think? …Occupants and servants at all times to freely pass and re-pass on foot, or with horses, cattle, beasts of burden, wagons, carts, sleighs, carriages, or other vehicles whatsoever to and fro, over said right of way as above bounded and described.. This did have cars by 1926 and the horses and sleighs were almost a thing of the past. And just how long did people keep cattle in Beacon? 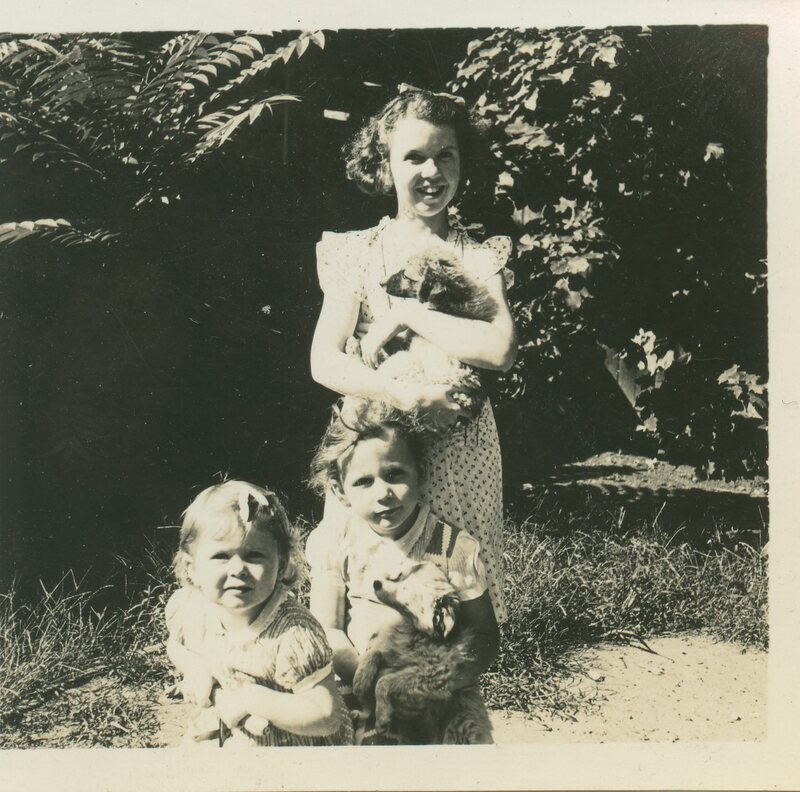 Yesterday was day 29 of the Family History Writing Challenge. It’s officially over. I plan to continue writing, but now I have some better ideas on how to write, and re-write this Family History book of mine. I was bogged down in the research, which is the part of genealogy because you never know what you might find. I know can research and still continue to write. After I do some research, whether it’s at the archives, or in a book, or online, I will write it up and weave it into the story. Today I worked on some of the Whelan story. I had forgotten how many good stories Aunt Angela told me.